While I was putting my daughter to bed last Wednesday night, I was nagged by the feeling that I hadn’t gotten enough done that day. Sometimes the only way to shut that voice up is to go back and list everything that you did do. So here it is, a day in the life of this mom. In my oldest child’s baby book, there is a page where I wrote down everything he and I did, in detail, one day when he was 9 months old. I love to go back and read that now. You forget all the little things. Awakened at 5:15 am by middle son, who is mad that we switched his underwear to a Pull-Up while he was sleeping. Baby girl wakes up too. I hold them off for a while, but eventually we go downstairs. I am in shock because usually they sleep til at least 7. Feed guinea pigs and cats. Turn out all the outside lights, open the windows. Snooze on couch til 8 while kids watch TV. Realize how late it is (normally oldest kid leaves at 8:10). Walk him to school with baby girl (hubs watched middle son, who fell back to sleep in recliner). Come home, feed other kids. Vacuum the family room and playroom. Play a couple rounds of a “Memory”-type card game with middle son while baby girl plays in playroom. Unload and reload dishwasher, wipe down counters and table, wash pots and pans from dinner last night, sweep floor. Go back downstairs and take out guinea pigs for me and middle son to hold for a while. Return pigs, sweep floor around their cage. Review email from baseball coach and add playoff games to our wall calendar. Get kids dressed. Plead with middle son to wear weather-appropriate, clean clothes. Feed kids and myself lunch. Take kids to my dad’s, because he is watching my baby nephew for a few hours and needs a little break/help with feeding him lunch. Hold nephew, decide to have fourth child. Watch children regress to jealous balls of resentment, decide not to have fourth child. Return home, put baby girl down for nap (she fell asleep in car). Agree to play Power Rangers with middle son. Play until I physically can’t keep eyes open; put on TV and pass out for 45 minutes while he watches “Olivia.” In my defense, it was raining and extremely dark out for daytime. Baby girl wakes up; rouse self and get everyone ready to pick oldest up from school. Husband texts that he will pick him up. Let kids mess around on front porch and front lawn in the rain. Give all kids a snack. Fold two baskets of laundry. Install new Wii motion sensor bar so oldest can play Wii for first time in forever while middle son watches. Set up “magic” (Color Wonder no-mess) paint for baby girl. Work on organizing large batch of hand-me-down size 5 clothes for middle son, which have been sitting in dining room forever. Supervise three-way wrestling match that ensues. Kick all kids outside into muddy yard. Go on computer and look for “water shoes” for kids. Yell at middle son for jumping in huge muddy ditch near driveway, then let him do it anyway. Clean mud off floor when he comes in to use bathroom. Call kids in, supervise removal of muddy clothes and washing of hands. 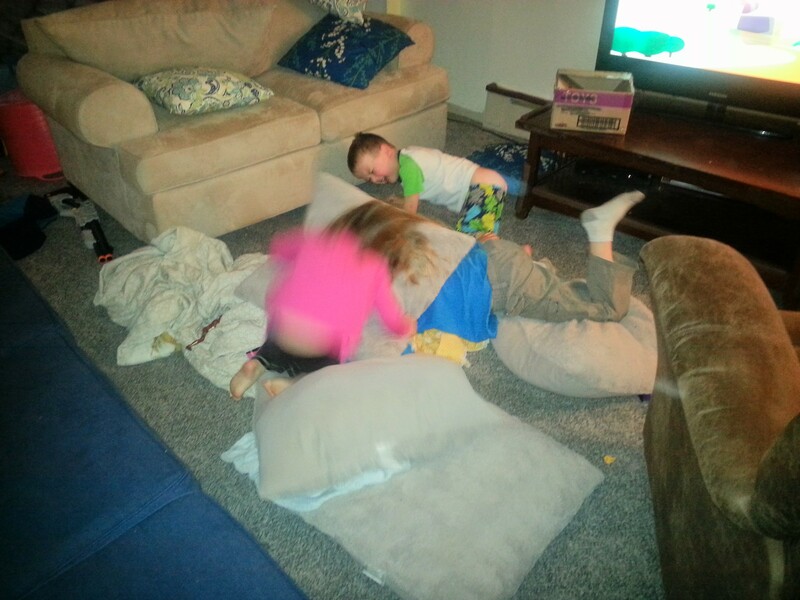 Husband takes over with kids (four-way wrestling match). Clear table, unload dishwasher, load dishwasher, run it, leave pots and pans for next day. Go on computer and look up seasonal allergies, try to figure out means of relief (in addition to medication) for oldest, who is really suffering. Also order wall sconces for my bedroom as part of remodel. Supervise kids’ clean-up of playroom. Husband takes baby girl with him to Staples. Middle child freaks out. Put on TV. Around 8 pm, make boys get in tub. While they bathe, go around putting away folded clothes and straightening up bedrooms. Go back and wash their hair. Let them go back downstairs and wait for daddy. Hubs and baby girl finally come home. Wrangle everyone upstairs, supervise teeth-brushing, read stories. Hubs is with baby girl and me with boys; tag team after baby girl requests Mommy. Sit in rocking chair and fret about what didn’t get done. Perform nighttime Mary Kay ritual. Go downstairs, lay on couch, get on computer, book hotel room in Massachusetts for first leg of our trip to Vermont. Husband gives me awesome footrub. Pop a handful of Advil. There was also one poopy diaper and a couple wet ones; lots of squabbles, yelling, hitting, and time-outs; lots of hand-washing; lots of picking throw pillows off the floor, because that drives me crazy; lots of standing around checking Facebook from my phone; lots of texting my husband, my dad, and my sister; and some snuck-in reading on my phone of this long New Yorker article on the Newark schools. I shall do this exercise tomorrow, love it! Thank you for sharing! Thanks! I wish I had a record of a “day in the life” from when F was an infant and N was a toddler. That time is such a blur.